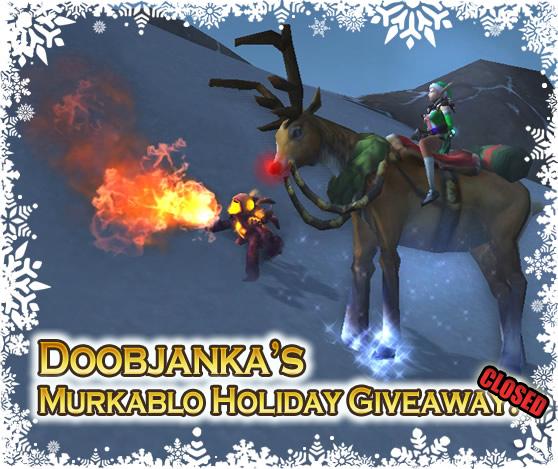 We recently held a holiday contest giveaway to celebrate the holiday season and to commemorate Doobjanka's four years of volunteer work at WarcraftPets. Two entrants were randomly selected at the end of the contest to receive one Murkablo each. Congratulations to Antaeus and Epicleptic! You can check out their entries here and here. A color-changing mystery present and festive kodo calf? Yes please! We'd like to thank everyone that participated in our holiday giveaway. There were so many amazing and creative entries — 34 pages worth in fact! Again, we would like to express our gratitude to everyone for making this giveaway a success and so much fun. As always, thank you for your continued support. We hope to bring you more contests in the future, and of course up-to-date information on the latest pet news. Here's to a pet-filled New Year!